Jon will tell us how we can begin to build strong local communities designed on the bedrock of deep nature connection. He will explain specific practices that will help us repair our culture and create the structures that increase bonds and strengthen relationships between individuals and individuals, individuals and the group, and individuals and nature. See parts 1 & 2 on Storytelling & Peacemaking (recordings). Karen Studders will explore how to increase Government awareness about the Transition Movement and how engaged Citizens involved in Transition Initiatives might partner with local government during these times of dramatic change. We're excited to be contributing to the making of ‘In Transition 2.0'. ReadDirector Emma Goude's 3rd updateon the film, tentatively set to release this Fall. Transition Town Totnes wins an Ashden Award! Our friends at Chelsea Green are taking pre-orders of the Transition Companion. Order your copy, and maybe even one for your local library.. Transition US Board Member Pat Benson talks about the Transition movement as a guest this week on Wisconsin Public Radio - have a listen. Transition US is looking for a temporary volunteer to help with a straightforwardinternet research project. We anticipate this short project taking between 5 - 10 hours. If you are interested and able please contact carl@transitionus.org. We're delighted to announce that Richard Heinberg will be hosting our conversation with Rob Hopkins on July 18th. 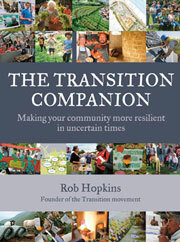 Rob is the author of the Transition Handbook and co-founder of the Transition Network. Join us, bright and early, for this special event! This month we welcome three new official Transition Initiatives and the first official Transition Initiative in Rhode Island! Browse the initiatives map and learn more about becoming an Official Transition Initiative. For the last 50 years, throw-away consumer culture has led citizens of industrialized societies to forget many of the basic skills that have sustained humans for generations. Facing the prospect of a world with drastically reduced access to energy and material goods, a rising network of Transition Town advocates, urban homesteaders, permaculture activists, and DIY proponents are retraining communities to manage their own food, shelter, waste, transportation, health, clothing, and models of exchange. This month, Transition US and The Evolver Social Movement will explore the pioneering organizations and individuals who are empowering us to build vibrant, resilient, and sustainable communities as part of “The Great Reskilling.” The 40+ regional Spore chapters will feature workshops teaching anything from sock darning to bee keeping, cycle maintenance to rooftop gardening, aquaponic systems to natural building, solar panel installation to bread making, herbal walks to alternative currency. YERT (Your Environmental Road Trip): 50 States. 1 Year. Zero Garbage? Called to action by a planet in peril, three friends hit the road - traveling with hope, humor, and all of their garbage - to explore every state in America in search of the extraordinary innovators and citizens who are tackling environmental crises. As the YERT team layers outlandish eco-challenges onto their year-long quest, an unexpected turn of events pushes them to the brink in this award-winning docu-comedy. Featuring Bill McKibben, Wes Jackson, Will Allen, Janine Benyus, Joel Salatin, David Orr, and others. (Watch the trailer) -- screened and recommended by Transition OKC. This great guide (think of it as Peak Oil 101 with a sense of humour) put together by Erik Curren over at Transition Voice, tackles some of the nagging questions around Peak Oil, like: What is Peak Oil? Why should I care? Why's everyone so worked up about 'net' energy? Isn't activisim just a waste of time?? >> take me to it! Our early release of 500 autographed copies of Richard Heinberg's new book The End of Growth created a huge stir this month with all 500 copies selling out in under 24 hours. North American based readers can pre-order copies from our publishers New Society, or for those paperless readers amongst you, the book is available for Kindle. Catch up with the latest releases of content from the book on our website.